Wyman Plumbing & Mechanical offers professional water misting systems for installation around the North Valley. Enjoy the Arizona outdoor lifestyle year-round by enhancing your patio, pool or outdoor space. Expand your usable living space with an outdoor cooling power to get temperatures down up to 30 degrees! Hot weather will no longer be a factor when planning your next party or outdoor barbeque. With our patio misting systems, you can turn on the climate control system and enjoy spending time with your family and friends outdoors! Expand your leisure time options with outdoor water mist cooling whether it is taking the party outside or having dinner on the patio. Professional high-pressure misting systems – We use professional misting products from premium quality pumps to the nozzles that are custom designed by misting experts and then installed by our plumbing professionals. 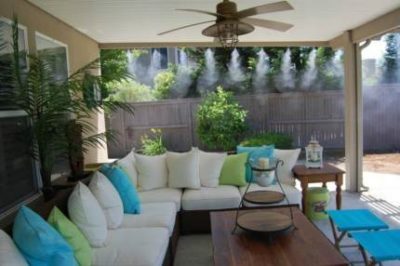 Our outdoor patio misting systems work by pressurizing water and forcing it through small openings in a specially designed mist nozzle to create fine water droplets. As the mist evaporates, it produces a cooling effect up to 30 degrees. We offer customizable designs and solutions such as powder coated stainless steel mist lines to match your home’s exterior. 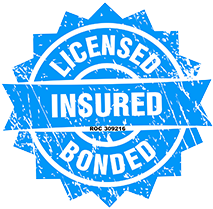 It is important to choose a licensed, bonded and insured contractor when you are investing a lot of money in your outdoor space.